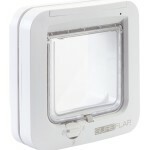 SureFeed Microchip Pet Feeder Review - Does It Really Work? PRODUCT DESCRIPTION (4.2/5) SureFeed microchip pet feeder is a selective microchip feeder that works with RFID technology. The feeder has a lid that stays closed at all times blocking the food that can only be accessed by the assigned cat through its microchip, either collar tag or implanted. If your cat is not micro-chipped you can use a SureFlap RFID collar tag that works the same. When an authorized microchipped cat approaches the feeder and puts its head underneath the hood to eat, the lid will automatically open, allowing the cat to eat. The lid will only open if an authorized cat stick is head under the hood. SureFeed comes with 2 detachable colored polypropylene bowls and one silicone mat for a nice looking unit. Each bowl has a capacity of approximately 2 2/5 cup dry food. 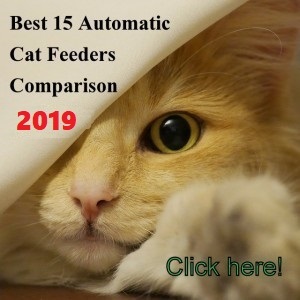 If you set up 2 or more feeders, you can identify each unit with its respective cat by purchasing extra colored bowls and mats or simply to have a backup set. Mats are designed to catch spilled food and they match the bowls. The unit works with 4-C alkaline batteries and it features a low-battery indicator. Batteries last from approximately 6 months to a year, depending on the usage. SureFeed is not designed to work with rechargeable batteries. 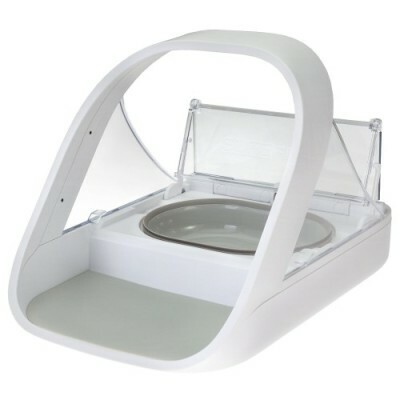 It comes with a single portioned bowl for dry food and a split portioned bowl to feed wet and dry food. Lid protects food and keeps smell and flies away from the food. 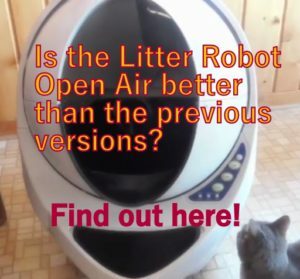 The unit has a hood with sensors on both sides so when the cat approaches the front of the feeder and sticks its head under the hood to eat, the sensors recognize the microchip ID and open by swinging the transparent lid up that is blocking the food, allowing the cat to eat. The feeder will stay closed at all times, preventing other unauthorized pets to eat. By setting the unit in “intruder mode” if the feeder senses an unregistered cat while the authorized cat is eating, the lid will shut. Once your cat is done eating and walks away from the feeder, the lid will close, keeping the food sealed, fresh and protected from the non-registered pets or kid’s hands. 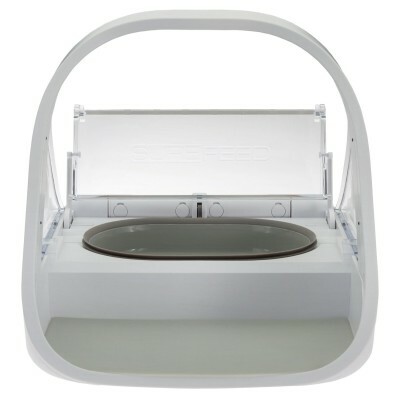 The unit is safe for kids and animals because the lid is strong enough to push the cat’s nose out of the food, but if it feels something blocking the closing, like a finger or a paw, it will stop the lid from closing and will try again. The pressure applied by the lid is not enough to hurt animals or people. Unlike other RFID or IR feeders, SureFeed ensures that your cat’s head is always in contact with the RFID sensor since its head is under the hood at all times while eating. 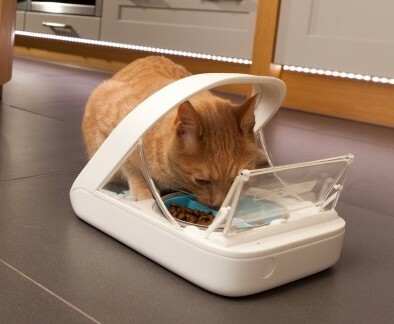 This prevents the lid from shutting if your cat turns its head while eating, which happens with sensors that are located right in front of the unit. As long as your cat has its head under the hood, the lid will stay open. The time delay for the lid to close after the authorized cat walks away can be adjusted to 3 delays: I, II and III. With delay “I” the lid shuts one second after losing contact with the microchip, delay “II”; two seconds and delay “III”; 3 seconds, approximately. The unit comes set on standard delay II. The unit is solidly constructed. The feeder is compatible with any existing microchip worldwide. An option of your cat using an RFID collar tag if is not micro-chipped. You can register several cats to eat from the same feeder, up to 32 different IDs. It allows you to control each cat food intake (by setting up 2 or more units). Excellent to protect your pet’s prescription diet. Rubber seal around bowls provides a good sealing, covering smells and protecting against flies or other insects. The feeder’s arch gives a wide range of RFID sensitivity so if the cat turns its head from the feeder the lid won’t close. 4-C batteries on the bottom of the feeder give the feeder a good weight and stability. Low-battery indicator allows you to know when to change batteries. 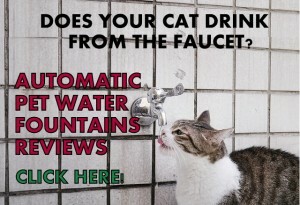 It stops dogs and small children from accessing your cat’s food. You can buy extra bowls, mats and collar tags. The unit is basically a free feeding bowl for the authorized cat, thus it doesn’t stop glutton cats from gorging all the food at once. 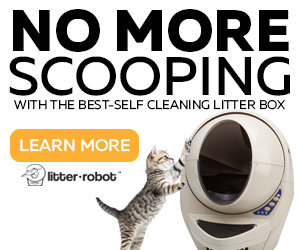 It does not have a timer, so you can’t split your cat’s daily intake into several portions throughout the day (if you are not home to refill the bowls). It does not have an ice pack to keep wet food cool. Bowls are not dishwasher safe. It does not have AC adapter, designed to work only with 4 x C alkaline batteries (not rechargeable). Some stubborn cats might be able to get their head between the side and the lid and steal food that way (place the unit against a wall to block the back gap of the feeder to stop that). Try not to place the feeder close to metallic/electrical appliances. To ensure the best operation of the RFID sensor, they need to be kept clean at all times. When registering your cat’s microchip, make sure there is not another non-authorized cat in the proximity or this may cause an unintentional registration of another cat. If this happens, you have to do a factory reset of the machine. The User’s Manual comes with training tips for different types of cats, including timid cats. 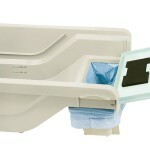 You can’t put the feeder in the refrigerator or place ice packs inside the feeder. If you have a cat that is aggressive when time to eat and you think this idea won’t work for your cats, you can check the article I wrote about how to manage two cats competing for food. 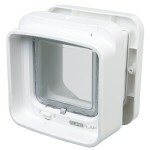 SureFeed Microchip pet feeder is a very good microchip selective cat feeder that works as advertised. 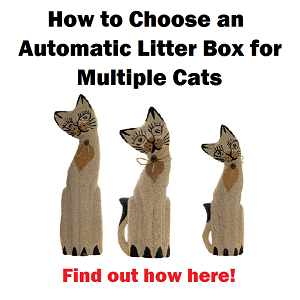 This unit is especially recommended for multi-cat households where one cat is being food-bullied and does not get to eat and the other cat is getting overweight. In this sense, this unit is a real solution for cat owners that work all day and can’t control this eating activity. Isolate a sick cat’s bowl in a multi-pet household, so the feeder avoids saliva transmission between pets. On the suggestion of our vet, we purchased one of these for our dear, very elderly cat with dementia and thyroid problems who requires a special rich diet food, but she only eats little bits at a time throughout the day. We’d been driven nearly mad because we have another cat who needs light food, and a dog, both of whom prefer the old cat’s food to their own and were sneaking in and helping themselves to it at will, which was no good for any of them. We found the feeder VERY easy to set up, and the old cat was very easy to train to the feeder – not in the way suggested, but just by holding her carefully and gently behind the frond legs and gently introducing her head under the bar till it opened and she could smell her food. We did this just a few times when it was time to feed her and she quickly had the idea down pat! Now she feeds at will day and night, (but we replace any little bits not eaten, daily)and the feeder keeps it fresh and even ant free! (a nice bonus!) We can now be sure she is getting what she needs and the other two pets are eating their own food, while still trying to figure out how it works! (Ha! Ha!) Just one thing I’d suggest – I would not buy the divided dish again, – our cat finds the bar down the middle confusing, as it is right where the animals mouth goes when the flap lifts, – weird! So we either feed her kibble OR wet food, or mix them together in one and we don’t use the divided dish at all. I know it was expensive- but to us- worth every penny in the long run for the peace of mind it has brought and the ease of use!! NO MORE FOOD STEALING PROBLEMS!! YEAY!!!!!! how do I set this up to recognize my cat’s microchip? He had the transmitter on a collar but has lost the collar & I cannot find it. Thanks. Hi Julie, I am not sure if I understand your question but if your cat lost its collar, there are replaceament you can buy. Since the unit registers up to 32 different microchip IDs, you just scan the new collar on the feeder and it’ll start working. I have mistakenly bought 4 small skinny AA batteries (which fit inside but on the left of the battery compartment)instead of 4 x ‘C’ batteries, advised in the instruction booklet, which in the shop look too wide and chunky to fit into the battery channels inside the battery compartment of the Surefeed microchip feeder. Please advise whether the chunky C batteries really fit, as I can’t return them if I buy them and they’re the wrong fit. I find the battery pack labels confusing! Hello Genni, the feeder works with 4 C size batteries. 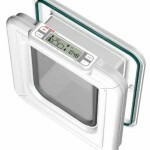 You can contact SureFlap Company by phone, they answer right away (no recording) and they can help you with this. Their phone number is 1-855-461-4740 Thanks for your question. My problem is that my kitten eats all his food and then moves onto the puppies food! Is this product suitable for a small dog (Moodle) because she’s always missing out! Hello Claudia, the SureFeed is suitable for your dog to use it, unless she is a chewer in which case is not recommended. Is there away to delete the number from my overweight cat as she has learnt how to get into the feeder. Does the feeder register every cat that puts its head into the feeder, because we did NOT train number 2 to use the feeder but husband n i have both witnessed fat cat eating…we have not bn able to catch her opening it yet! 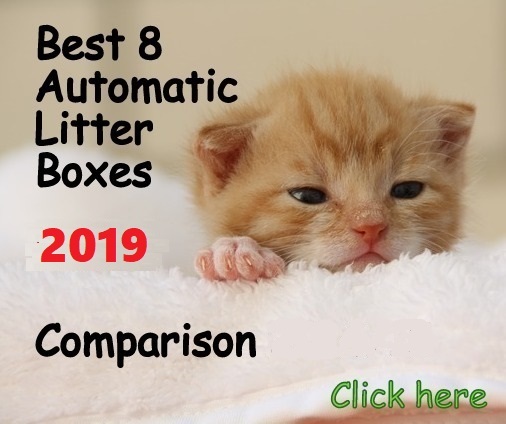 Hello Ngaira, the only way a cat can be registered is by pushing the small button located in front of the feeder (the button with a little cat`s face) and then making your cat to eat so the feeder registers the ID. Your cat alone couldn`t have done it. Most likely your chubby cat finds his way to eat when the allowed cat finishes, before the lid closes. You can adjust the speed of the lid to close faster by switching the speed to I. The delay slider can be found at the bottom of the feeder. Hope that helps! Can rechargeable batteries be used in these? 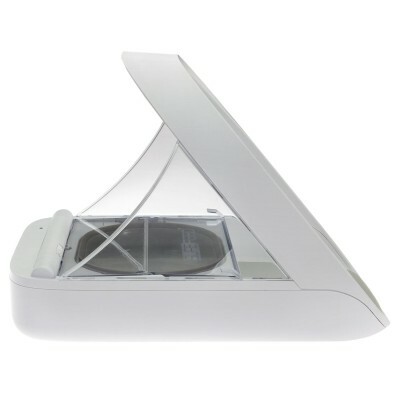 Hello Laurie, this feeder works with good quality 1.5 V alkaline C Cell batteries. This will ensure the best performance of the feeder. The SureFeed is not designed for use with rechargeable batteries. The light at the back of the feeder will flash a red light every few seconds if the batteries are low. Love this. Wish Had gotten it sooner, would have saved a lot of anxiety. I have two cats on two different foods. Feeding them is so easy now and no longer waiting for them to eat their fill and then hide their bowls is wonderful. 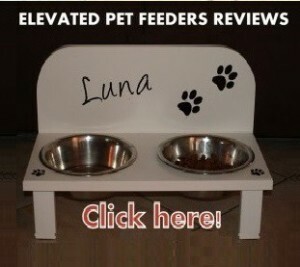 I highly recommend getting this feeder. The batteries last quite a while. My only complaint is that to get extra dish inserts, the postage/handling is as much as if not more than the cost of dish itself. Hi Catherine, thanks for sharing your experience with this feeder! Will an owner’s implanted medical device interfere with the feeder’s function (or vice versa)? Hello Staci, I don’t believe it will. Been using my SureFeed for 2 months and it’s wonderful. You say the red light will flash every few seconds when the batteries are low, but mine flashes red every once in a while. Like once or twice one day, then it won’t flash red again for another week. It only flashed red maybe 5 or 6 times in total. What does this mean? Hello Patricia. the red light is exclusively low battery indicator. If your feeder shows that light often and then the feeder keeps working I must say the indicator is not working properly. It’s showing a fake low battery indication. You can call the customer service and they may guide you how to fix that issue. I hope that helps!